​Chizuru stops Mami from leaving as she isn’t done talking yet. Chizuru tells Mami that she needs to think about Kazuya. Mami says Chizuru is being annoying, and that this problem is a matter between her and Kazuya and none of Chizuru’s business. Chizuru looks down, and has an awkward expression. Meanwhile, Kazuya is crying. Chizuru just came back to her apartment, but Kazuya is standing in her way. Kazuya says thanks, and confesses that he saw everything that happened between her and Mami. Chizuru is shocked, and Kazuya explains that the Karaoke station they went to is the place he works at. Chizuru apologizes to Kazuya, saying that she failed to get him a girlfriend. He doesn’t understand why Chizuru is the one apologizing. He thinks that he loves Chizuru. He likes her back hair. He likes her white skinned legs. She may seem cold, but is actually generous. She may be tough on others, but she thinks about everyone more than anyone else. Chizuru says as his rental girlfriend, she will continue to try her best so he and Mami will become a couple again. ​Chizuru asks what Kazuya means by “I want you”. Chizuru says he shouldn’t have phrased it in such a awkward way. Kazuya apologizes, and thinks that his mouth slipped. Chizuru explains that the only reason for starting the rental job was to train her acting skills, so once her job as an actress increases, she will have to quit the rental business. Kazuya says he understands and gets back to his room. He lays on the ground and regrets that his mouth slipped. But he thinks that he seriously loves Chizuru. Kazuya thinks that the countdown for destruction has ticked off, and that he has to tell his grandmother that he broke up with Chizuru. But remembering his grandmother crying out of happiness, he just can’t do it. He thinks that it’s fine to tell her once Chizuru has officially quit her job. He searches for Chizuru’s acting job, and finds her next stage job. Going to the theatre, he sees all kinds of goods of Chizuru and is impressed that she has been working so hard while going to college. As he gets into the hall, he sees someone who is respected by others, and remembers Chizuru’s words that this time a major director will come to see her on the stage. He feels like he came to watch the end of him and Chizuru. And right behind him is Sumi. Sumi looks like she wants to talk to Kazuya, but the buzzer signals the beginning of the play, so she doesn’t say anything and quietly sits on her seat. Kazuya recalls Chizuru’s words saying that she will quit her rental girlfriend job. Kazuya thinks that if this play goes successfully for Chizuru, then their relationship may also finish. The girl acting as the princess appears, and Kazuya realizes that Chizuru is not the main character as he had assumed. He wonders what kind of role Chizuru has. Umi appears, and Kazuya is shocked that he is also involved in this play. Umi calls for Onene, and Chizuru appears in the role of a ninja. As Chizuru is acting different than usually, Kazuya feels a bit awkward watching her, so much that he can’t focus on the play. The audience are laughing at the jokes Chizuru’s role is playing. Even Kazuya to laugh, and he starts to enjoy the play. Kazuya: “You’re incredible Mizuhara. She’s obviously standing out…!! Is it because of the script…No…It’s because Mizuhara’s expression and the tempo she acts. And that is what attracts the audience…! !” Kazuya is amazed at Chizuru’s acting skills. 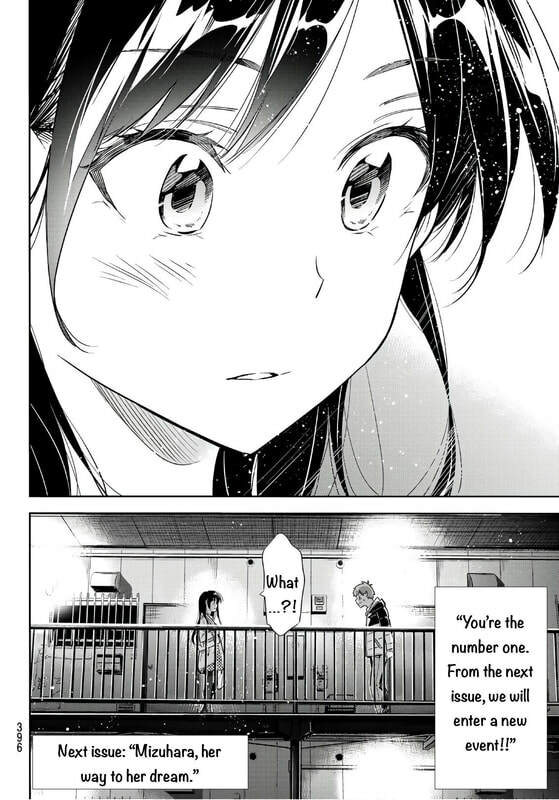 After the play finishes, Kazuya realizes that even though Chizuru is not the protagonist, it is obvious to everyone that she stood out the most. As everyone is going home, Sumi wants to approach Kazuya, but after looking at Kazuya’s expression, she smiles and walks away. The director and the staff are complimenting Chizuru, saying she was impressive. Chizuru says she tries to act like she’s someone else on a daily basis. The director says that she should be the one to get the role. Chizuru humbly answers that’s not the case, but she seems satisfied looking at her note saying “The goal for this play: Don’t leave any regrets.” At that moment, Chizuru overhears a conversation. The protagonist girl from the play talks with the prestigious director. The other actors say that she has been chosen for the role. Apparently, they know each other since she was in elementary school. The other actors say that’s unfair. Chizuru looks shocked, and she angrily holds her files. She walks away, and Umi asks if she won’t participate in the party. Kazuya is in a cafe by himself, and he assume that Chizuru got the role, so she will quit her rental girlfriend job. He bumps against someone, and it turns out it’s Chizuru. She realizes that he came to see her play. She complains that she feels bad thinking about her other customers. Kazuya apologizes, but compliments her saying that it was really really good. But Chizuru says that she didn’t get the role, and Kazuya is confused and asks why. Chizuru: “It’s because I didn’t have enough talents..” She says that nothing can be done about it, and she still has another chance next time. As Chizuru says that this also means she can continue being a rental girlfriend for a while, Kazuya thinks it’s the worst since he finds himself happy. After Kazuya tells Chizuru that they aren’t the same, he promises her that he will rent her next week, and the week after that, and the week after that as well. Chizuru asks him how much he thinks that will cost him. But Kazuya doesn’t care. He says he will earn the money through his work again. In order to rent Chizuru again, he will work everyday. After Kazuya’s speech, people around them are thinking that they are fighting. Chizuru stamps on Kazuya, saying that he shouldn’t promise things he can’t fulfill. Chizuru is at home now and Umi calls her. Chizuru says she had to go as she was called by her Grandmother. Shiori (the protagonist that got the role) is with Umi, and she thanks Chizuru, saying that the success this time is because of Chizuru. Chizuru sits on her floor, and looks at her file. Her countless notes emphasizing points like “Speak loudly here! Have the right tempo! Tumble! Nod here!” are visible, but what stands out the most is the part she highlighted, “Don’t get in Shiori chan’s way”. It looks like she’s crying, and at that moment, she receives an e-mail. It’s an e-mail notifying her that a customer (Kazuya) has booked a date with her. She recalls Kazuya’s words “So please don’t say that you want to give up! !” She receives more e-mails notifying that Kazuya has booked a date with her.